Catalyzed reactions are typically used to accelerate the rate by which a specific chemistry proceeds. Essentially, the action of the catalyst is to provide an alternative, lower energy pathway for the reaction. For this to occur, the catalytic substance interacts with a reactant and forms an intermediate compound. This intermediate is transient in that after it forms, it breaks apart leaving the original catalyst species unchanged. A catalyst is not affected by the reaction as far as the chemical structure or mass at reaction completion. Heterogeneous Catalyzed Reaction is when the catalyst and the reactant exist in two different phases, such as a solid catalyst with a reactant in solution. Homogeneous Catalyzed Reaction is when the catalyst and the reactant are in the same phase, such as when the catalyst and the reactants are dissolved in the same solution. What Is Important to Measure in Catalyzed Reactions? Catalysts create an alternative path to increase the speed and outcome of a reaction, so a thorough understanding of the reaction kinetics is important. Not only does that provide information about the rate of the reaction, but also provides insight into the mechanism of the reaction. Catalyst interaction with a reactant is also of interest. Catalyzed reactions produce transient intermediates that are the key to the catalytic process, the reaction rate, and the end-products. 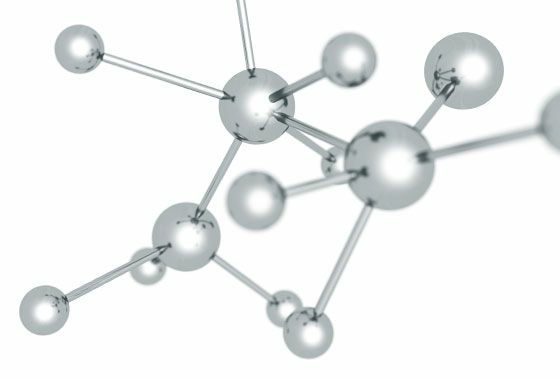 Identifying intermediates produced by catalytic reactions is an ongoing area of research, and tools that give insight to the presence and structure of the intermediate are useful. Measuring the effect of reaction variables and conditions on a catalytic process is important for reaction optimization. Temperature, pressure, reactant, and catalyst concentrations, as well as other chemical and physical parameters have profound effect on the products, yield and by-products produced in a catalytic reaction. Investigating the activity and measuring products and by-products produced by different catalysts for a given reaction is important in order to choose the best combination of catalyst and reaction conditions. Measuring and understanding the energetics of a catalyzed reaction are important to ensure a safe reaction and successful scale-up. Investigate homogeneous and heterogeneous catalyzed reactions under actual reaction conditions, including at elevated pressure and temperature. Detect and aid in the identification of key catalyzed reaction intermediates. Rapidly acquire data for determining reaction kinetics, understanding reaction mechanism, and pathway. Instantly track and measure products and by-products produced by catalytic reactions. 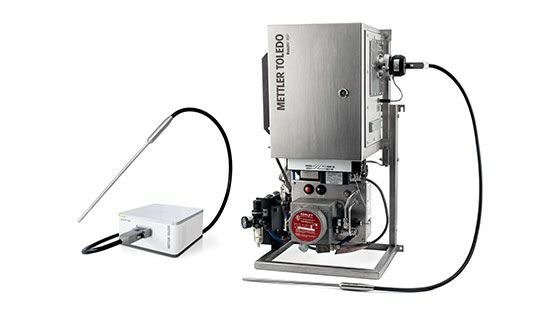 Test and develop ideal reaction conditions for optimizing end-product yield and minimize side products. Rapidly determine best catalyst and conditions for specific reaction. Eliminate the time delays that come from traditional sample extraction and offline analyses. Eliminate the introduction of air, moisture, or disturbing reaction resulting from sample extraction. Minimize operator exposure to toxic chemicals, potentially energetic reactions, or hazardous reaction conditions. Adapted with permission from Tuba, R., Mika, L., Bodor, A. Pustai, Z., Toth, I. and Horvath, I., “Mechanism of the Pyridine-Modified Cobalt-Catalyzed Hydroxymethoxycarbonylation of 1,3-Butadiene”, Organometallics, 22, 2003, 1582-1584. Copyright (2018) American Chemical Society. Using high pressure ReactIR, researchers investigated the hydromethoxycarbonylation of 1,3-butadiene to methyl-3-pentenoate. In the presence of pyridine, Co2(CO)8 was known to catalyze this reaction. At the time of the research, no intermediates had been identified and one of the goals of the project was to identify intermediates. Initially, methanol was used as a solvent and the 1,3-butadiene was added to an equilibrium mixture of Co2(CO)8 and [Co(MeOH)6][Co-(CO)4]2 under 75 bar of carbon monoxide at 100oC. 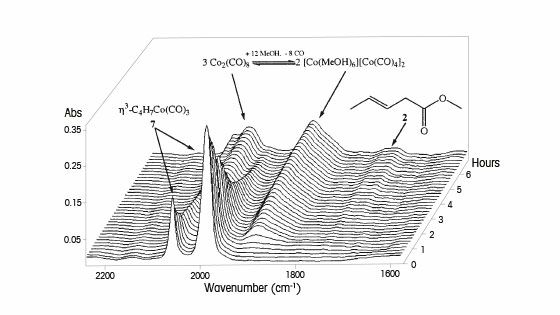 Based on the ReactIR profile, the researchers identified an intermediate, η3-C4H7Co(CO)3,and after heating the reaction for several hours, the methyl-3-pentenoate product formed along with a mixture of Co2(CO)8 and [Co(MeOH)6][Co-(CO)4]2. ReactIR revealed and aided in the identification of the cobalt intermediates and provided additional insight into the catalytic mechanism. When pyridine was used as the solvent, the intermediate species [CoPy6][Co(CO4]2 was the only metal species identified. 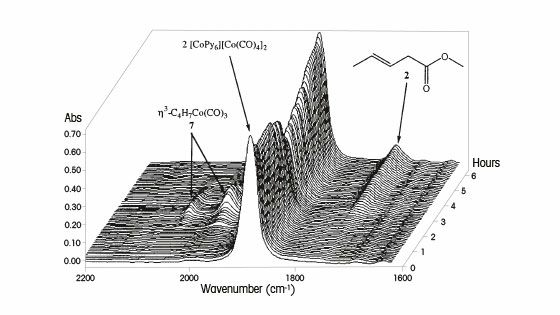 After the mixture was heated, the cobalt-pyridine intermediate disappeared and the presence of η3-C4H7Co(CO)3 and the methyl-3-pentenoate product was observed in the ReactIR spectral profile. With further mixing under temperature, the η3-C4H7Co(CO)3 intermediate converted to[CoPy6][Co(CO4]2 and additional pentanoate product formed. The researchers reported that the conversion of η3-C4H7Co(CO)3 to methyl-3-pentenoate was four times faster when pyridine was used as a solvent, as compared to methanol. In this example, ReactIR was useful for detecting the cobalt-pyridine intermediate and provided information about the catalytic mechanism. ReactIR revealed that the conversion rate was much faster when pyridine was used as a solvent. This demonstrates the use of in situ FTIR in determining the best catalyst/solvent combination for optimizing a catalytic reaction. Rueping, M., Bootwicha, T., Sugiono, E., “Continuous-flow catalytic asymmetric hydrogenations: Reaction optimization using FTIR in-line analysis, Beilstein J. Org. Chem. (2012), 8, 300-307. In this research, scientists showed for the first time the capability for continuous flow chemistry to perform a catalytic asymmetric transfer hydrogenation reaction. 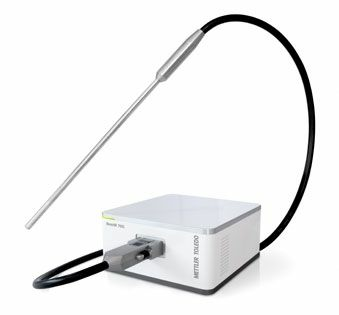 To monitor the formation of the product, a ReactIR system equipped with a specially designed ATR flow cell was utilized and coupled with the microreactor. Since one of the goals of the work was to find an optimum set of conditions for the reaction, the ReactIR was attached at the end of the reaction stream. 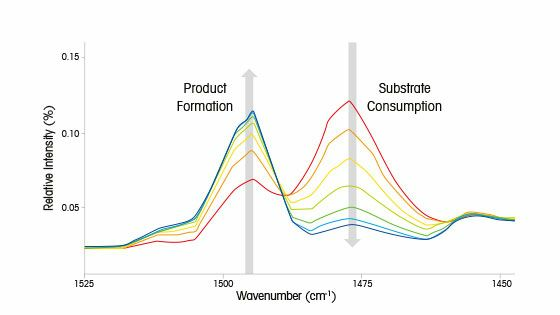 The ability to track these bands in real-time with online FTIR provided the means by which optimization of the reaction was accomplished. Among the many advantages of using continuous micro flow technology for investigating reactions is the ability to rapidly change reaction variables, such as reactant and catalyst concentration, flow rate, and temperature, and to see the effect of these changes on the reaction outcome. In the catalyzed asymmetric hydrogenation of benzoxazine to dihydrobenzoxazine, a ramping of reaction temperature from 5 oC to 60 oC was performed. 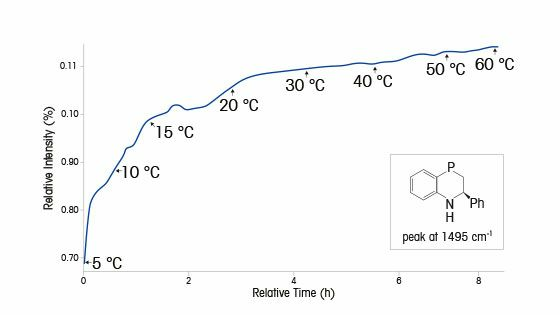 The authors reported achieving a 98 % product yield by performing the reaction at 60 oC at a flow rate of 0.1 ml and a residence time of 1 hour. Using the information from this initial work, the scientist went on to apply this catalytic microflow reaction protocol to a series of benzoxzines, quinolines, quinoxalines, and 3H-indoles. Reaction conditions for each of these series were optimized. The streamlined profile fits easily into physically constrained areas such as a fumehood. Options are available for batch or flow chemistry, and a variety of conditions including elevated pressure/ temperature reactions and corrosive reagents. Infrared measurements can be made continually and unattended for as long as necessary to accommodate a synthesis. iC IR software makes set up and obtaining reaction profiles straightforward and intuitive. 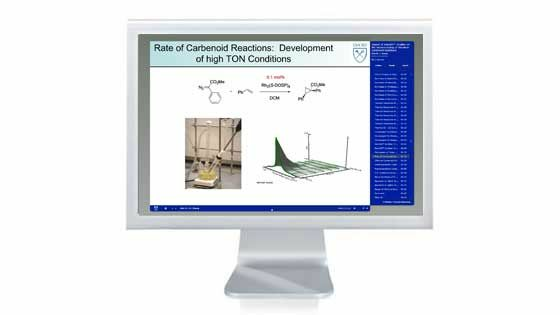 iC Kinetics and Reaction Progress Kinetic Analysis software is available that uses the IR data to quickly and easily develop reaction rate information. In this webinar, Huw M. L. Davies, Professor of Chemistry at Emory University, discusses Fourier Transform Infrared (FTIR) spectroscopy to understand the effect of catalyst, substrate, and carbenoid precursor on the rate and efficiencies of rhodium catalyzed reactions. Optimized systems with a substrate to catalyst loading of greater than 1,000,000 were developed. The study of donor/acceptor carbenoids which are the central intermediates behind the chemistry. How to apply carbenoid chemistry towards the synthesis of pharmaceutical targets. Small volume chemical synthesis reactors allow chemists to quickly and efficiently carry out experiments day and night with control over temperature, mixing, dosing, and pH. Combining automated lab reactors with unattended representative sampling or in situ analytical tools provides an additional level of process development understanding from particle size to the molecular level of reaction route, kinetics, and reaction progression. 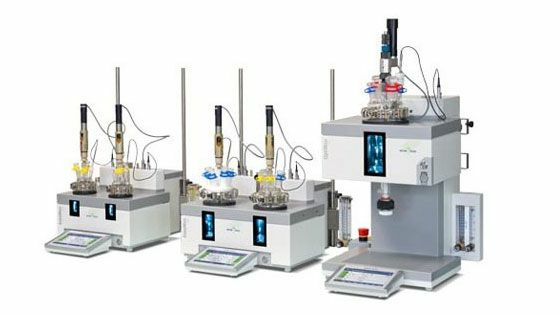 These chemical synthesis reactors are easy-to-use, experiments highly repeatable, provide reports in One-Click, allow secure data storage and sharing data, and results that can easily be shared between those working around the globe. Willcox, D., Nouch, R., Kingsbury, A., Robinson, D., Carey, J., Brough, S., Woodward, S. “Kinetic Analysis of Copper(I)/Feringa-Phosphoramidite Catalyzed AlEt3 1,4-Addition to Cyclohex-2-en-1-one” , ACS Catal. 2017, 7, 6901−6908. 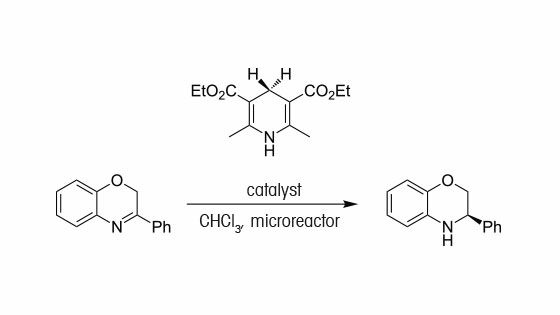 Das, U., Higman, C., Gabidullin, B., Hein, J., Baker, R. T., “Eﬃcient and Selective Iron-Complex-Catalyzed Hydroboration of Aldehydes”, ACS Catal. 2018, 8, 1076−1081. Fu, W., Nie, M., Wang, A., Cao, Z., Tang, W., “Highly Enantioselective Nickel-Catalyzed Intramolecular Reductive Cyclization of Alkynones”, Angew. Chem. Int. Ed. 2015, 54, 2520–2524. Höfler, D, van Gemmeren, M., Wedemann, P., Kaupmees, K., Leito, I., Leutzsch, M., Lingnau, J., List, B., “1,1,3,3-Tetratriflylpropene (TTP) – A Strong, Allylic C–H Acid for Brønsted and Lewis Acid Catalysis“, Angew. Chem. Int. Ed. 2017, 56, 1411-1415. Atodiresei, I., Vila, C., Rueping, M., “Asymmetric Organocatalysis in Continuous Flow: Opportunities for Impacting Industrial Catalysis”, ACS Catal. 2015, 5, 1972−1985. Zhang, Y-M., Yuan, M-L., Liu, W-P., Xie, J-H., Zhou, Q-L., “Iridium-Catalyzed Asymmetric Transfer Hydrogenation of Alkynyl Ketones Using Sodium Formate and Ethanol as Hydrogen Sources”, Org. Lett. 2018, 20, 4486−4489.